We will simplify your content by using plain English that even your hair dresser can understand, while covering the topic with precision and clarity, so that even a brain surgeon will nod his head. If you need any of these reports to be written, our report writers can help. You provide the data and the points you want to make, and we’ll provide the writing to help you make those points – effectively and professionally. To hire a report writer, please let us know what type of report writing you need and the points you want to make. Just fill in the form on this page to let us know how we can help. Clients come to us with the following typical dilemma. They want a professional and official sounding report, but they don’t want to put readers to sleep or make it too hard for them to understand what is in the report. Anyone who has had the misfortune to read through several annual reports or committee reports knows how hard these can be to read. Every report does two things. It informs and it sells. Yes, even an annual report is a form of sales pitch, with company owners, clients, suppliers and partners being the target markets. Focus on a single, most-important message. Use plain language to better reach your readers. Tap or click to read more on how to write an effective report. We write effective reports by focusing on your principle message. Before even sitting down to write a report for you, we need to know what is the top message you want to get across. To be sure, your organization has many messages, but any effective communication focuses on one top priority. We can save you money. You can achieve success with our help, as our other customers have. You can count on our expertise in this niche (or in solving this problem). We are looking for opportunities. This past period has been successful. We have a plan to turn things around. We are well-positioned for future growth. We write effective reports by using plain language. Most in-house reports speak a completely unhelpful language. They often focus on “our products” and “our team”. And they often use needlessly “fancy” words, industry jargon, acronyms and long-winded, self-promotional language. That kind of report writing actually blocks your readers from getting your message. Most in-house reports are about the company producing them. Effective communication is never about the writer. It’s never about the speaker or the company. It’s always about the readers and the audience. That’s where plain language comes in. Plain language focuses on making it easy for the reader to read. Even somebody with a PhD is more likely to read through your material if it’s an easy read, if it speaks to them. Plain language means using simple and common words (as in this case study). Plain language means making short sentences and paragraphs that don’t confuse readers. Plain language means focusing on clarity of the message rather than impressing people with the size of your words. Nobody ever bought from you because you can sound pompous. They buy because they see and feel benefits for themselves. You can publish effective reports by including images. There are several reasons to include images in your reports. A picture can tell a large part of a story. When people can visualize something, they understand it better. Data is particularly difficult for people to understand. But in a graph form, such as a pie chart or a trend line, people really get it. People retain what they’ve read much, much better if an image is part of the information you give them. If you need help writing your annual report, white paper or case study, our freelancer agency can help. For a free quote on writing your next report, tap or click the red button to the right. Some reports are mandatory. Financial records and projections, as well as compliance with regulations, have to be reported. Other reports are optional. These can be powerful tools in your sales and marketing arsenal. 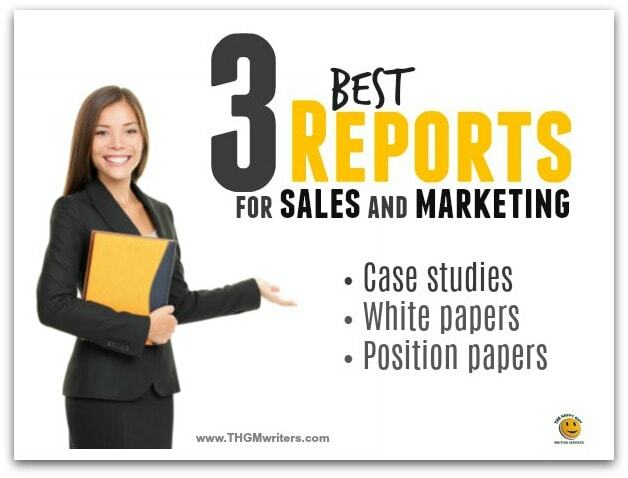 Tap or click to learn more about the top 3 most effective reports for sales and marketing. Case studies – let us write them for you. This can be the most effective report for marketing and sales, especially for business-to-business (B2B) sales. A case study describes the work you’ve done for a client and the results you got for them. It’s all about the before and after. Here is an example of a case study. A case study gives potential clients a glimpse into what you do. It’s the next best thing to actually watching you work. In fact, it’s better; in one short read, they get to see you work and see the results. Why is a case study such an effective report for marketing and sales? Leads get to know you. Leads get to know your work. Leads get a sense that you know what you are doing. Leads can see the relevance of your work by how it helped similar companies in similar situations. Leads can see the results, real data from a real-life project. It is much more believable than claims in your marketing materials. The best way to make use of case studies is to have several of them. Once you identify your target market, prepare a case study for each of them. One of the best sales pitches is showing how a similar company benefited from your product or services. Just don’t make it sound like a sales pitch. Case studies typically run 1,500 to 3,000 words. Once you’ve assembled your information, let us know. We’d love to be your freelance case study writer. White papers – let us write them for you. “White paper” is a murky term. Traditionally, it refers to authoritative reports from government, usually proposing a framework to address an issue. Businesses use the term “white paper” to refer to authoritative reports that propose a way to address certain problems or situations. Often, this means recommending best practices that include the company’s product or service. A white paper is usually longer and more in-depth than a case study. It generally advocates a certain position, a recommended approach to a topic or situation. Ideally, it cites research and has graphs and charts to back up any claims. It is always fact-based. You are an authority in the field. The report draws on real-life experiences, such as your own case studies. It does not sound like a sales tool. It is a complete guide (a one-stop-shop) to solving the problem or making an improvement. A white paper is effective because it does two important things. First, it positions you in all the same ways as a case study does. Second, it positions your product as part of a larger solution. When the potential client is ready to take action, one of those actions will be to call you. White papers typically run 3,000 to 10,000 words. Once you’ve assembled your information, let us know. We can also help with research, but you should provide data and results of your own experience, as well. We’d love to be your professional white paper writer. Position papers – let us write them for you. Position papers are probably the most under-used and under-valued type of reports. That’s a pity. Officially, the “position” in “position paper” means that you take a position on an issue. That issue might be political, societal, moral or almost anything else. Unofficially, the “position” means that you position your company in the minds of your target market or government regulators. Choosing a position to take can be tricky. You have to choose a position that your target market will like. All positions are somewhat controversial; otherwise, they are not positions, just platitudes. But you probably don’t want to be overly controversial. We can help you develop a position that maximizes the benefits and minimizes the risks. Position papers typically run 2,000 to 10,000 words. Once you’ve assembled your information, let us know. We can also help with research, and even with defining your position strategically. We’d love to be your professional position paper writer. If need a business ghostwriter to help write your marketing report, we can help. For a free quote on writing your next case study, white paper or position paper, tap or click the red button to the right. To get crisp, clear and effective report writing, just fill in the form on this page and let us know how we can help you. Whether it’s a progress report or an annual report writer, a consultant’s report or a white paper writer that you need, we are standing by now. If you need to communicate to a business or government audience, if you need to be understood and sound official at the same time, let us help with your report writing. Tell us what you want to accomplish and what you need by completing the form on this page. I want a report to promote my business. Where can I get one? (ANSWER: We can write one for you. If you let us know the details in the form on this page, we will provide a free quote. How do I find freelance report writers? (ANSWER: Our report writers are all freelancers who have proven themselves in both their writing and their dedication to our clients. How much does it cost to write a report? (ANSWER: The price depends on many factors, including the length of the report, research that might be required and any visual aspects. We’ll be happy to provide a free quote if you provide the details in the form on this page. How long should my report be? (ANSWER: That depends both on the goal of the report and the information you want to share with your readers. We can help you determine that, if you wish.